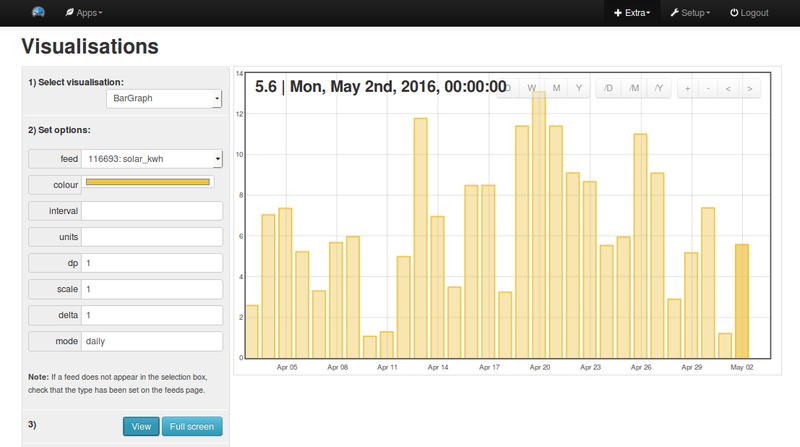 Emoncms supports the creation of daily, weekly, monthly kWh data and graph’s from several different emoncms input types. The standard emonTx and emonPi firmware transmit real power values for each CT channel. Accumulating kWh data can be calculated from this power data using the emoncms “Power to kWh” input processor. Note: use the CREATE NEW option and add _kwh to the feed name in order to help distinguish it from the power feed. In the inputs interface select the power input for which you wish to generate kWh data. Click on the spanner icon to bring up the input processing configuration interface. Select the power to kWh input processor and create a feed, select a feed interval that either matches your post rate i.e 10s on the emontx and emonpi or for reduced disk use; intervals of up to 3600s can be used. Some energy meters provide kWh output via Modbus, RS485, MBus, IEC1107, etc. For those meters, the log to feed input processor could be used. However, if the data is irregular, missing data will be recorded as null values. If a null value happens to coincide with midnight, the bar graph produced will show spikes or gaps. At present the process to use is the Wh Accumulator input process. It will fill any missing data. The Wh accumulator has a 23 kW limit equivalent power limit for inputs that are cumulative Wh. In the inputs interface select the input for which you wish to generate kWh data. Click on the spanner icon to bring up the input processing configuration interface. Select the wh accumulator input processor (note: this process can also be used for accumulating kWh inputs) and create a feed, select a feed interval that either matches your post rate i.e 10s on the emontx and emonpi or for reduced disk use; intervals of up to 3600s can be used. A x calibration can be applied to convert raw pulse data into kwh/wh data, see Optical Pulse Sensor setup page. Note: At least 2 days of data is required to generate a daily kWh graph from accumulating kWh data. At the moment, the bar graphs built using the vis module don’t show the current day’s kWh consumption. The myelectric app, which also uses the accumulating kWh feed type, does show the current day. Click on Extras > Visualisation, and select the BarGraph. Select the accumulating watt hour or kWh feed created in step 1. Delta: The important property here is ‘delta’. With delta set to 1, the bar graph will draw the total kWh for each day calculated from the kWh value at the end of the day, minus the kWh value at the start of the day. Scale & Units: If the feed is in watt hours, the scale can be used to convert it to kWh by multiplying by 0.001. Units can be set in the units field. Interval: The interval property can be set if you wish to have kwh at a set interval such as kwh per hour, for daily, weekly, monthly data use the mode property. Mode: Use this property to obtain timezone correct kwh data. Set to either daily, weekly or monthly. 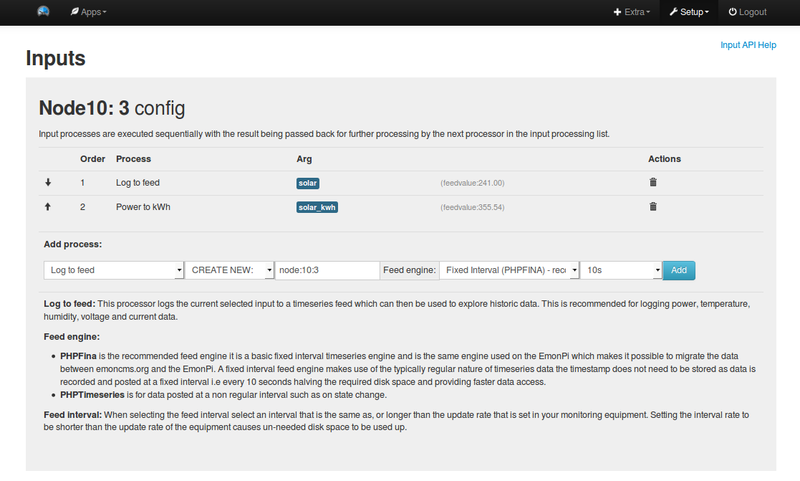 The same options can be used in dashboards for the same output. All of the visualisations in emoncms that make use of daily data also support this approach including: SimpleZoom, Stacked, StackedSolar, Zoom and OrderBars.